Carol Warden grew up near water and spent most of her summers doing her best to become a fish. From there, Carol spent five years in saltwater sailing the seas with the US Navy. After that time, she started her degree in Geography and her heart longed for more freshwater. 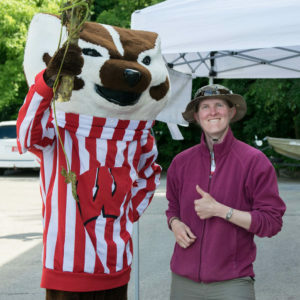 Carol was employed by UW Center for Limnology as a student while finishing her undergraduate degree then moved right into acquiring her Master’s degree in Water Resources Management through the Nelson Institute on the UW Madison campus. Upon graduation in 2010, Carol took her current position with UW Trout Lake Station as an Invasive Species Outreach Specialist and have since expanded her expertise to include native aquatic plants as well as more comprehensive lake surveys including shoreline health. 3110 Trout Lake Station Dr. Feedback, questions or accessibility issues: limnology@mailplus.wisc.edu.